Remember your first few Valentine’s days with your spouse? Maybe you went on a special date, got each other gifts, or did something wild and crazy. Maybe you just sat together and shared quality time. Now add the years. Add the kid(s) you’ve had, the bills you’ve gained, the pets and the house. On top of that, throw in the huge responsibilities of raising a child with a disability. More than likely, those leisurely Valentines are behind you, buried beneath the obligations of your child’s care and your everyday lives. Maybe your marriage has become “child-centered” or “disability-centered.” For many couples—especially those who have a child with special needs—this is a mentality that is all too easy to slip into. So what can you do? How can you become a couple again instead of just two people sharing the same load? How can your marriage become a priority again? It’s very easy to allow the all-encompassing challenge of raising a child with special needs to define you and your partner. It can happen without you realizing it. Suddenly, you’re no longer that couple who loves dancing or goes paintballing every week…now, you’re just the parents of that kid with the disability. It’s important to remember that the couple underneath the label is still you and your spouse, and you love each other. Maybe you’ve been through some struggles over the years. What marriage hasn’t? Maybe some of your interests have changed. But at the end of the day, there’s one thing that’s constant: your partner is the only one who knows exactly what you’re going through and loves your child as much as you do, and is also on the same life-long journey. Because of your challenges, you have the opportunity to become a stronger couple. All you have to do is strengthen your bond. Remember that the next time your partner mentions being overworked or when he or she seems like they’re at their wit’s end. Give each other permission to vent and “blow off steam” every once in a while. Don’t judge each other and take anything personally in the heat of the moment. Take over a task if you can. This extra time will allow your partner to do something they enjoy but never have the time to. Are you the one who needs a break? There’s no need to feel guilty. Admit that you need a “time-out.” By trusting each other and speaking honestly, you’ll avoid fostering feelings of anger and resentment and improve your ability to communicate with your partner. Nobody can turn back time and no responsible couple can live as they did before children came along. Being the parents of a special needs child is just a new part of your marriage, but you can’t let it be the only part. By allowing each other to be “real” and “human,” you’ll not only foster good will and appreciation within your marriage, but you may improve the overall health of yourself, your partner, and your entire family. Okay, so, you’ve made time for yourself and your spouse separately. That’s great! 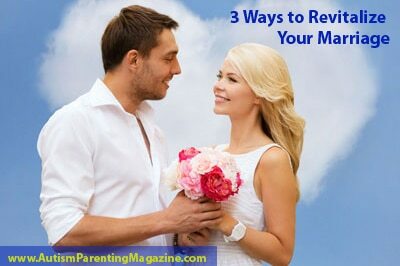 You’ve learned how to be people instead of just parents, but that’s not enough to reignite your marriage. The secret there? You shouldn’t feel guilty for wanting some time with your spouse to resume the activities, events, and hobbies you used to do before you had kids. In fact, it’s probably the best thing you can do for your family. Every couple needs and deserves some time together to reconnect and keep the emotional and communication bonds strong. It can be as simple as scheduling “fun nights” for yourselves on a weekly or monthly basis. Write it on the calendar. Enter it in your cell phone. Hire a caregiver for a few hours or ask a good friend or family member to stay with your child. It doesn’t have to be a 3-course meal at a 5-star restaurant. A movie or a quick bite at a local diner or restaurant is fine. The important thing is that you’re spending quality time together without trying to cook dinner, tend to your child’s needs, and clean the house at the same time. And remember, attention and affection for each other does not have to be reserved for just date nights and special occasions like Valentine’s Day. A little extra effort on both sides can generate ongoing intimacy. A kiss goodnight, a gentle touch as you pass in the hall, a love message by e-mail or text. These little gestures can mean so much. The magical final step to a happy, fulfilled, and newly-rekindled romance? Teamwork. And the foundation for teamwork? Respect and consideration. As partners and teammates, you both have to take shared involvement, responsibility and accountability for your child. No parent is allowed to “opt out” of their obligations, just because the other parent is “doing such a wonderful job” of managing everything. If you feel like the handling your child’s daily living arrangements isn’t being fairly shared, consider assigning tasks and splitting the load evenly. When you know what your spouse is in charge of, it’s a lot easier to see that you’re both pulling your weight. When it’s a free for all, it’s much easier to feel like the burden of responsibility has all fallen to you. Keep in mind, some things will fall through the cracks. That’s life. Unless you have superpowers, no one person can run a household, hold down a job, take care of kids and make sure there’s always gas in the car. Just decide which failures you can live with and what you can’t allow. Compromise will be essential. The most important thing to remember is that everything will be okay as long as you both are present, patient, flexible, honest and willing.